These KLOUD City Thinning Scissors are one sided hair thinning scissors which means that one blade has 28 micro-teeth, but other blade has razor edge. These shears are made of high quality tempered stainless steel for maximum durability and longevity, therefore, they have extra sharp and long lasting cutting edges. Considering the sharpness, they are perfectly suitable for thinning of thick hair. These hair thinning scissors are 6 inches long, but the diameter of their finger holes is 1 inch. They have screw for adjustment of tension, so every barber can adjust them for their individual needs. 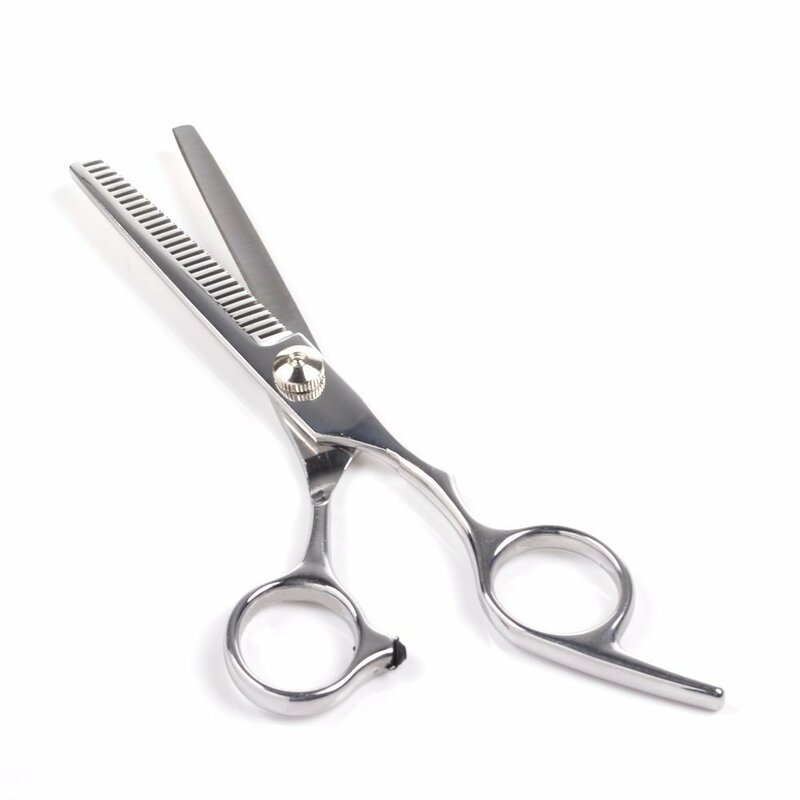 These hair shears also have non removable finger rest for better comfort and work ergonomics, but they do not have any finger inserts, therefore, they may be too big and unstable for some barbers. It should be mentioned, that all KLOUD City products come with small, silver color cloth which is intended for cleaning / polishing of tools, so they always are clean and shiny. These KLOUD City hair thinning shears do not come with any storage case, therefore, if it is necessary, it should be bought separately. These KLOUD City hair scissors have simple and nice design without special features – it is silver color with slight polish and it has no other decorative elements. These KLOUD City shears are intended for hair thinning and they are perfectly suitable for thinning of thick hair, because their blades are extremely sharp. Considering their advanced features and low price, they are suitable for those, who are cutting hair professionally, and for those, who are just studying this profession. These KLOUD City Thinning Scissors, as one might guess, are specially meant for hair thinning or, in other words, for reducing of hair volume. They are made of tempered stainless steel which is known as durable and long-lasting material, therefore, these scissors have the same properties. These hair thinning shears are one sided shears, namely, one blade has 28 micro-teeth, but other blade has razor edge. This product is 6 inches long and 2.4 ounces light. One of this product’s features is adjustable tension which is very important feature for professional hairdressers. It has finger rest, but it is not removable. Unfortunately it does not have any finger inserts, therefore, if barber’s fingers are not suitable for finger holes, they may be uncomfortable to use because of instability. These hair thinning scissors are silver color with slight polish for little sheen. This KLOUD City product can be used by professionals and students, because it has all necessary properties and affordable price as well. It does not come with any storage case, but it comes with small cleaning / polishing cloth like all KLOUD City products.